Single digit temperatures, led to boredom with being inside, which led to light-headedness, which caused me to take out a deck of cards. 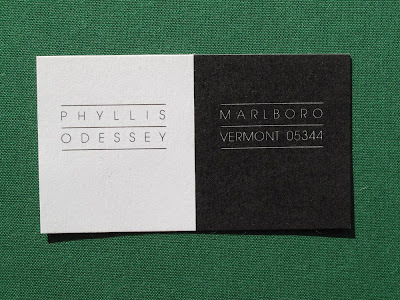 I started designing my own business cards many years ago, many professions ago, but not many places ago. My homes have always been New York and Vermont. That old cliche that says "as much as things change, they stay the same" is somehow eerily true looking at the aesthetic informing these cards. 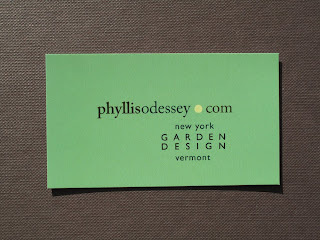 The very first card was typeset; I remember my surprise when I picked it up at a local Vermont printer. It actually looked the way I imagined. 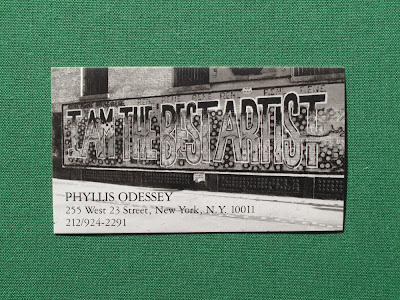 The next card was brought on by a fit of laughter walking down a street in New York and seeing this painted mural, especially after being rejected for a grant that would have legitimatized my title of artist. I needed a pair of silver pumps for a party, not a new business card. 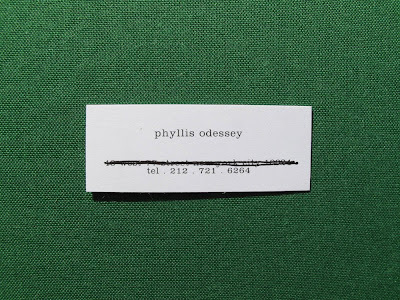 However, this high-end Italian shoemaker, offered customers a little tiny "calling card." Of course, it took months to get the card, printed in Italy or so they said. This card was a losable card, it didn't fit in a rolodex, easily fell to the floor and no one could ever remember what they did with it. Once you enter the world as a person with a website, you need a card that "matches" your website. Subsequently, the latest, if not the greatest was born. Sitting on the sofa, on a cold winter day, I am thinking not of sugarplums, but of the next design. In the process of cleaning things out, I've been reflecting on the nature of objects and their meaning. In my relentless quest to purge and organize, I found three keepsakes, I saved from the life of my husband's great aunt, who lived until she was ninety-eight and three- quarters. In the 1940's, she owned a lingerie shop. Family lore said it was a "fine" lingerie shop. Shortly, after owning the shop, she moved to a one-room walk-up in Greenwich Village, where she lived for 50 years. One room to store 50 years of belongings is a small amount of space. And so it seemed that clearing out this very tiny apartment would take no time at all. This was a room filled with tools and equipment both useful and out of date. This gteat aunt had gone blind during the time she lived in the apartment and it was organized so that things made sense spatially. I took three pieces of cloth from this home of 50 years. Today, I found them. Folded four times, these three items were squares we call handkerchiefs. All were expertly embroidered by someone decades earlier. I think its fair to say that that someone was not Chinese. They may have sat in a shop in France or New York City, doing handwork and were not particularly well paid for their efforts. I ran my hand over the three letters that appeared on each piece of cotton. An "A" "M"and the name "Mabel" spelled out. As much as I love the digital world, its way of connecting us to everyone on earth, its ease, its depth: I also love touching a real piece of history. Yesterday, I wrote about going paperless. Today, I've backpedaled. The act of keeping or not keeping, storing or not storing, archiving or not archiving is a weighty matter. The beginning of my digital journey consisted of ridding myself of notebooks filled with articles, announcements and invitations. Christmas Eve, the last notebook on the shelf called to me. One more to go. Filled with odds and ends from my parents house. Here was stationery from my father's business, birthday cards from my grandparents, invoices for an oriental carpet in the living room of my childhood home, lists of presents for friends and relatives to be purchased on a European trip in my mother's hand, fabric samples from when my parents redecorated the dining room with drawings of the chairs by my father (see photo), business letters my father had composed and report cards from my elementary school. Maybe this was my Christnas stocking. I really wanted to clear the decks. But I couldnt throw this stuff out. I thought about scanning all these mementos. It would be so much more accessible to have them available digitally. I resisted. I knew it wouldnt be satisfying. I liked the "objects". I enjoyed taking them out of their sleeves and touching the frail paper and looking at the handwritten entries in a savings book. A record of love and future hopes. Had old age set in? Was sentimentality talking hold? Did I need therapy to deal with an attachment disorder? I would like to be more Zen and focus more on the heart then the hand, but I still feel the tug of human records made on paper. It started yesterday. I rid myself of all my CD's and college-age stereo system. I replaced this antiquated poundage with the siimple and powerful itouch and docking system. I knew I was on to something. Encouraged, I went up to the study and looked at an entire bookshelf of notebooks. Notebooks filled over 15 years. Notebooks containing school records, articles from magazines and newspapers, announcements of lectures and courses, and published work. All protected for the ages in plastic sleeves. Before acting, I sat there for a maybe a minute and remembered how lovingly I had cut each article, organized each book: creating a mini-library of places to go and things to do. A minute isn't a very long time and in no time I took the plunge. I opened the first notebook and removed each article from its sleeve. Ann Ravers entire canon from the nineties came spilling out. I wasn't sorry to be getting rid of it, but I was sorry to realize that the Thursday section of The New York Times hardly ever contained an article about gardening and certainly not of the caliber of Ann Raver's prose. Next, I went onto the announcements of lectures, workshops and classes. There was so much going on, it took an entire notebook to catalog it. After this came the articles from Gourmet. My wish list of places to travel: the Trentino-Alto Adige region of Italy. Restuarant after restaurant, meals I imagined eating: Le 404 for North African food in Paris. Hotels to be remembered: Chateau de Fere in Champagne Country. Further education needed: Anna Tasca Lanza's cooking school, ninety minutes outside Palmero. Artisanal food: The best buffalo-milk mozzarella in Italy: Azienda Agrituristica Seliano. Business cards and museum brochures saved, records of classses taken and fees paid, fancy menus, hand-drawn maps, even a tidbit from The New York Times about Rumpelmayer's, a now defunct palatial ice-cream parlor on Central Park South. The floor was covered with paper, some yellowed with age, some glossy and a few of exceptional heavy stock. All this paper was a reference, a guide, a hope chest of ideas and intentions. I threw all this unwanted "debris" into several paper bags with nostalgia, but not longing and added it to the brush fire pile. Went back into the house, turned on the ipod and began my paperless journey. I reached for a pencil to write something down and quickly realized that my digital training wheels were still a little wobbly. Lever House, the modernist icon on Park Avenue is Gordon Bunstaft's masterpiece and the precursor to all those anonymous, mediocre, buildings that people our cities. Who would dare take this striped down, office building and decorate its surface? 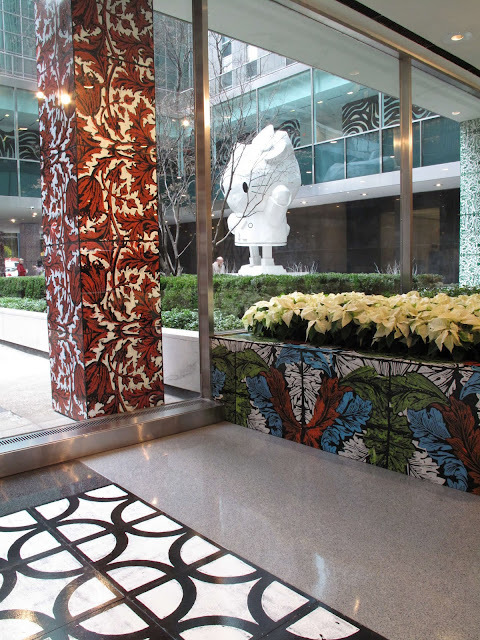 Richard Woods, in his new piece, called Port Sunlight patterns forty columns, eight Noguchi marble benches, exterior and interior planters and sections of the floor inside Lever House: the result, a present to all city walkers, who stroll down Park Avenue at the corner of 53 street. 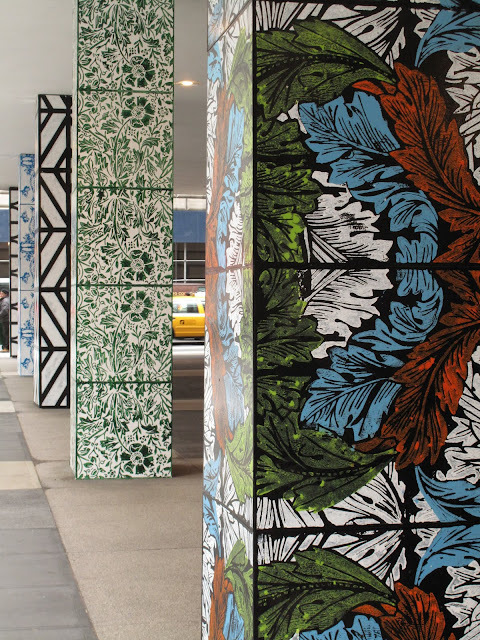 "The installation for the Lever House uses a multitude of commonplace, 19th century patterns, including William Morris inspired graphic depictions of nature and mock Tudor architectural surfacing so common durig the early 20th century. 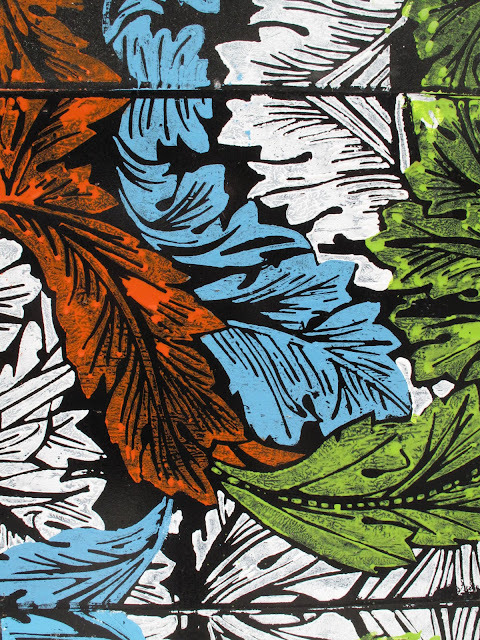 the patterns are woodblock printed onto wood fiberboard or alumnum sheets. The effect is to impose high Victorian decoration onto the elegant minimal language of the modernist building." I think I will spend part of my Christmas vacation thinking about how all of this can relate to garden design. 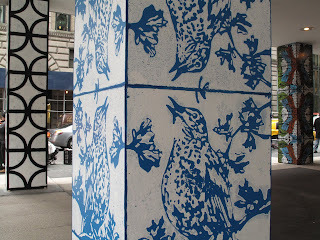 How one can take a very paired down, seemingly simple structure and create an ornate pattern around it. Woods's installation is a wink and nod and sometimes we need a little humor in the garden and in our lives. Excerpt from Apple Picking by Robert Frost. Some stuff does stick in your brain. The red balls (aka apples) in the orchard on my road reminded me of the Robert Frost poem, After Picking Apples. This poem, like all good poems, is a metaphor for something else entirely. And something else forced me to concentrate on what those strawberry-colored bombs signified in my landscape of bronze, gray and amethyst. After cutting back and raking the garden, I began my list of what I needed to move, to buy, to remove and to coddle. Most importantly, I paused and thought about what I want my garden to be. Part of that wanting is an ideal that can never be realized. Disappointment is often what I feel at the end of the year. Next comes ambition and desire. I garden, to garden another day. There is always another cultivar, perhaps an entirely different plant, certainly better compost or more of it and definitely new ideas. Seeing is integral to gardening and the orchard on my road invites me to look again and imagine a more perfect garden, perhaps in 2010 or 2011.